Finally! Days are getting longer, temperatures (slightly) warmer and the sun has even come outfew time down here in Weymouth. I was actually thinking the other day how I couldn't remember the last time sailing without being cold.. This past month has been a busy one as always. As a small hobby I've been lucky enough to be able to start learning how to sail a Waszp, a high performance foiling (or 'flying') dinghy. Using a hydrofoil under the water it generates lift in the same way an aeroplane wing does and rises out of the water at a certain speed. Its a awesome fun and great to learn how to foil, even if I've crashed and got wet loads of times! The Waszp foiling dinghy which I am learning how to sail. Flying above the surface of the water you go very fast which leads to some spectacular crashes! We've had a range of conditions throughout this month from very light to crazily windy. The month started off quite light and we had some awesome training in the sunshine and fog. I was testing out combinations of different equipment which was great and allowed me to gain a bit more knowledge on what measurements I want for future equipment. The first warm day of 2017. Pretty cool sailing in the fog as well. We then had a squad camp where there was a huge range of conditions ranging from a mega first day and gently calming down throughout the week. We are getting a good number of boats out every session which is allowing us to have intense sessions and good racing. Very close racing has allowed us to sharpen our racing skills up immensely. The week after the camp finished we got a surprise visit from Alex Thompsons HUGO BOSS. 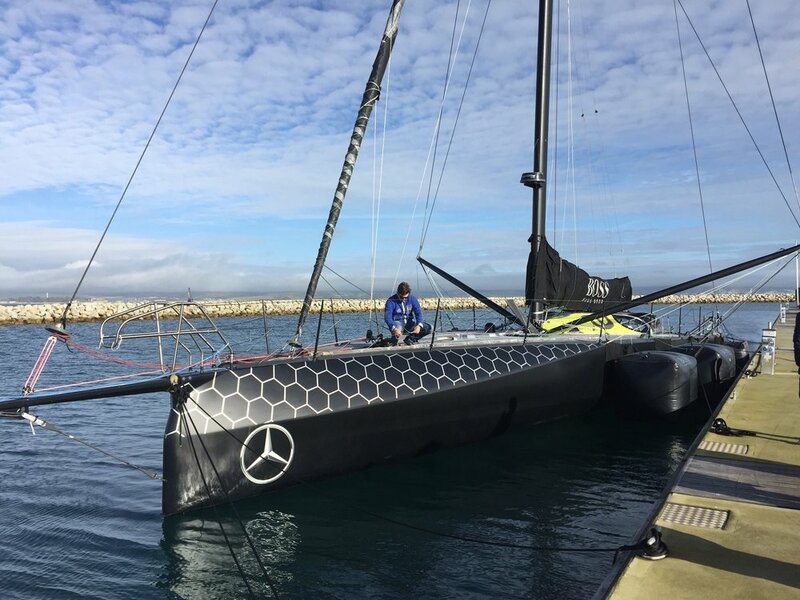 This carbon fibre round the world ocean racing yacht recently finished the Vendee Globe and even after losing her vital starboard foil Alex raced her to her max and finished a very close second place. After the finish she was sailed to Weymouth where she was moored up and I was lucky enough to have a look on-board which was seriously cool. Its amazing how much attention to detail goes into even a 60 foot yacht! I then had the first national competition of the year, the Noble Marine Worlds & Europeans qualifier held in Weymouth. It was great to have it at the place I live which simplified logistics considerably! After a long delay due to lack of wind the first day of racing did not go to plan at all. I was being very ambitious with my starts and often struggled to execute my manoeuvres in the final few seconds meaning I was already on the back foot. I then made some poor decision around the race course which ultimately put me in a poor position overnight leading into the second day. Day 2 of the competition went a lot more to plan. In the first race I had another disappointing 13th position overall however in the final two races I stuck to my plan, played the shifts and sailed fast to finish race 4 and 5 in 2nd and 1st overall. The weekends racing then finished and I was left in 9th place overall - not a disaster but a respectable result especially considering my first day dramas. I need to work on my consistency that's for sure! The next qualifier is once again held in Weymouth in March which should be great fun. Can't wait! Great sunset on the tow in after day 1. With my birthday being next week I am going home for a few days with the family before back in Weymouth for another intense squad camp. Fingers crossed the weather will be good!